I bet a someones brand (not saying who) has a 30mm cartridge kit with fully adjustable compression, rebound and spring preload with springs and fluid with fully adjustable shock with super cool New Hydraulic Spring Preloader but what brand has 40 years experience?, is it Apple? 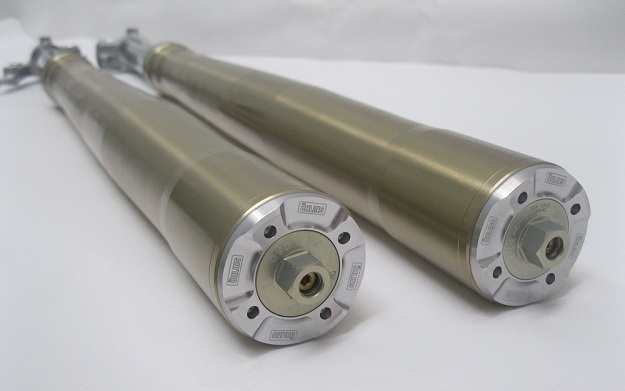 Ohlins Bm 303 and Bm305 shocks come with New Top Shock Bolt and upgraded hardened top shock mount with new style pin and bearing for added strength. 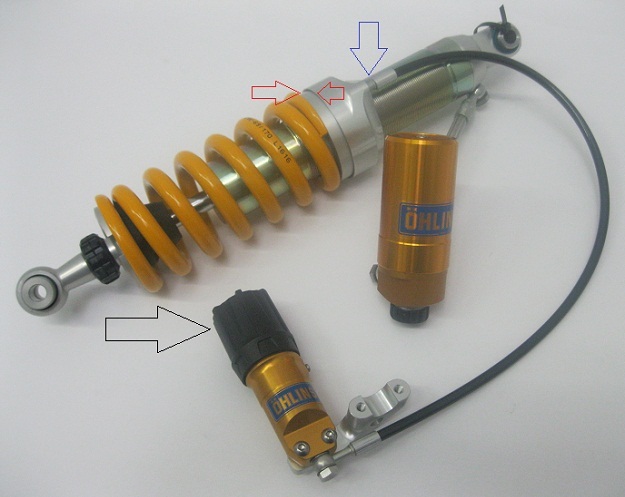 Ohlins BMW F800GS 30mm Fork Cartridge Kits (34.50mm O,D) , the best kits on the market today for the price and transforms your standard non adjustable marsh mellow fork into the ultimate adjustable large cartridge bottoming cone modern fork with adjustable external spring preload (18 Turn) , compression and rebound (aprox. 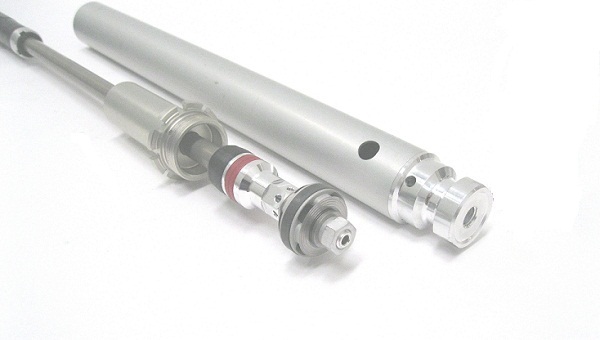 24 Turn) with hydraulic anti bottom out cones, many optional spring rates available. 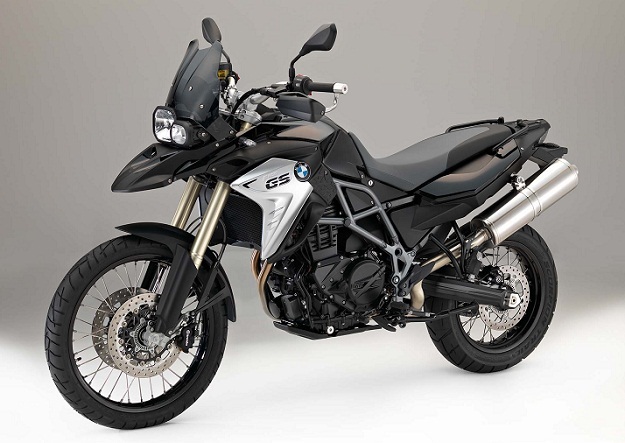 Ohlins offers excellent front and rear suspension upgrades for the popular Bmw F800Gs/ Adventure, one of our best sellers over the years and still is today! Above a lot has changed over the years, the Bm303 or BM305 is currently available in the with current updates, see mounting instructions below for for info PDF’s, Bm302 Obsolete NLA. These kits are surprisingly affordable given the technology improvement is like night and day, and you get a matched front and rear sets for a great price. 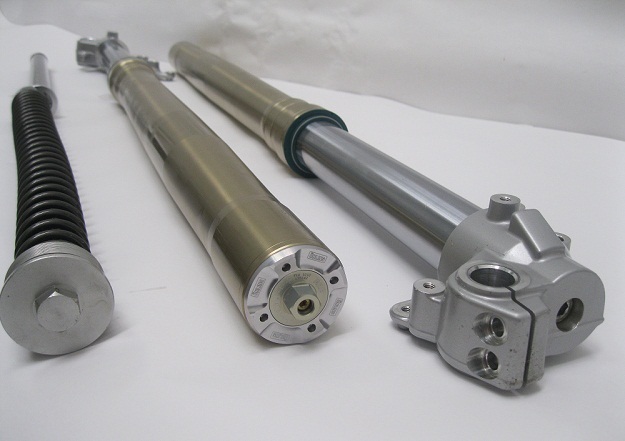 The above (Left ) Ohlins 30mm Cartridge Kit replaces almost everything in the forks including Springs (not Shown), It has fully adjustable Compression, Rebound and 18 turn Preload adjustable Caps, (Super Sweet!). 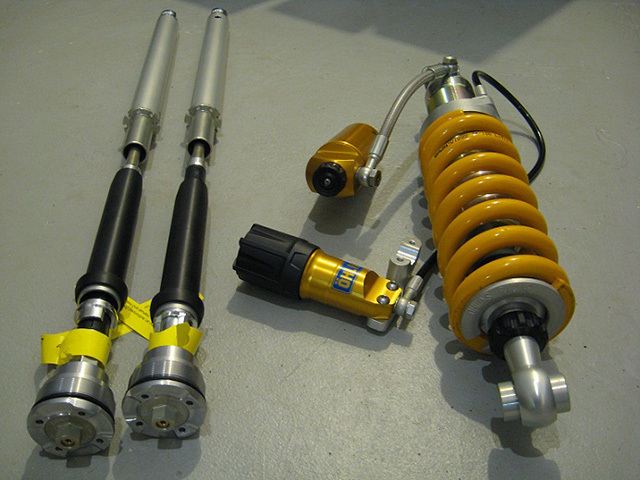 (Shown above Right) Ohlins BM303 shock with New Style Remote preloader does more range than the Ohlins older traditional preloader. 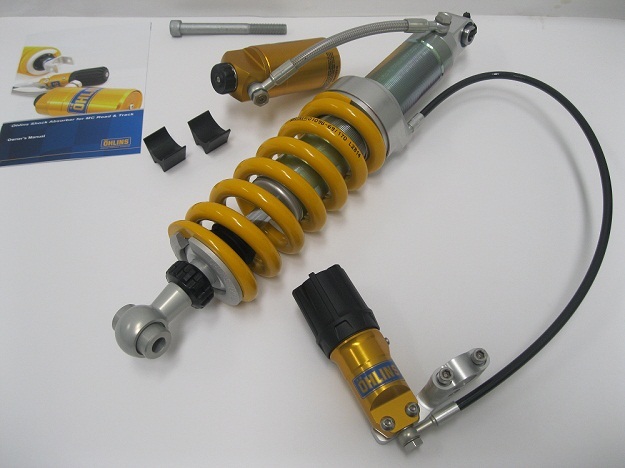 The above Ohlins shock is the BM303, fully adjustable with New style hydraulic spring preloader with 10+mm range, adjustable compression (25 click) adjustable rebound (45 click), many optional spring rates available, also heavy duty 46mm body and 16mm shaft. The Ohlins new preloader has more range than the older traditional ohlins preloader, both are still in use on various applications depending on fit and needs of function. Above pic shows some cool stuff, turn the preloader know (black arrow) and add preload to spring as needed. The Blue arrow shows 360′ pivoting hose line fitting. The red arrows show added range of preloader on spring. So if a spring has abount 11-12mm preload on it already, the preloader adds about 10mm + so a total of 22mm +- is all you would ever want total on this application meaning at a total of 22-23 mm preload you would then use a stiffer spring if needed for best results. Closeup view of preloader Bm303 shock preloader movement. 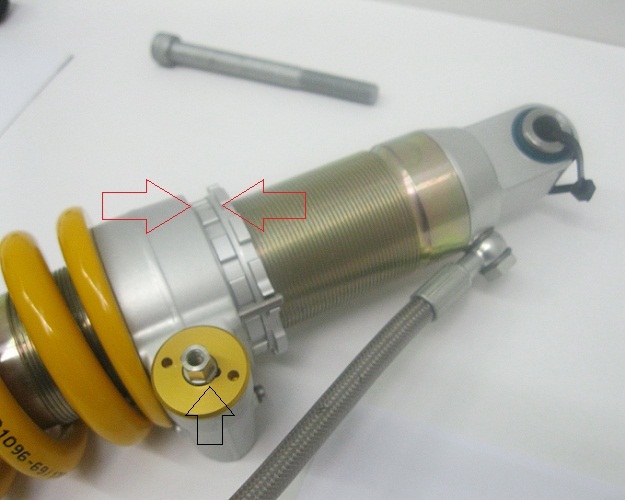 Bm303 comes with new top bolt (12mmx120mm) provided by Ohlins, some find the standard bolt not as strong. 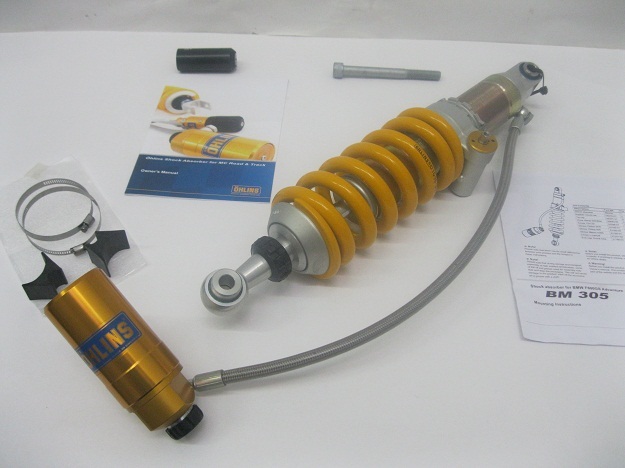 The BM305 Ohlins comes with New top shock bolt and improved top shock heavy duty mount along with integrated preloader. 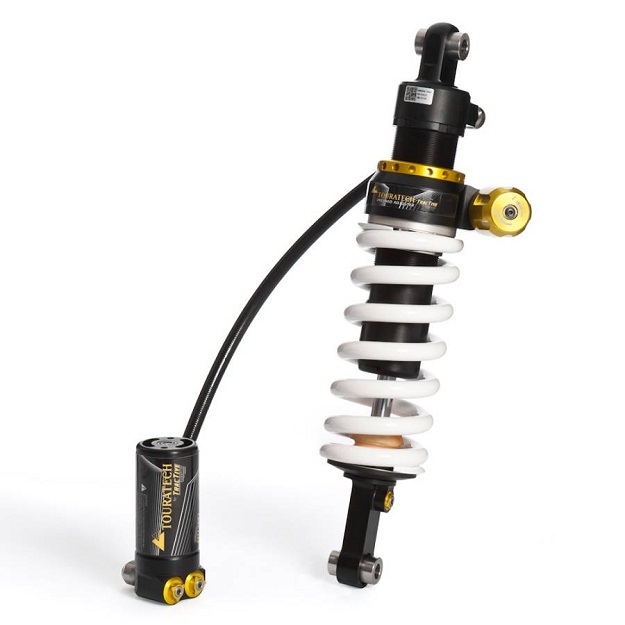 The BM305 shock fits 2014-On with integrated preloader shown, some like not having to mount a preloader anywhere. Above preloader is 8mm drive that turns the preloader about 10mm +. 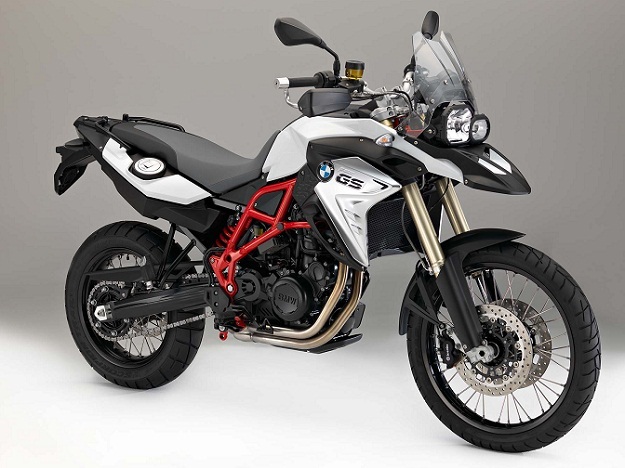 Ohlins BMW F800GS shock has a 46mm Body and 16mm Shaft, divided fluid and nitrogen via internal floating piston in main chamber. (Above) This was the older BM302 with a Integraded Preloader Shown, this is popular for same that have larger tanks and racks with more stuff in the way of mounting any remote know spring preloader. 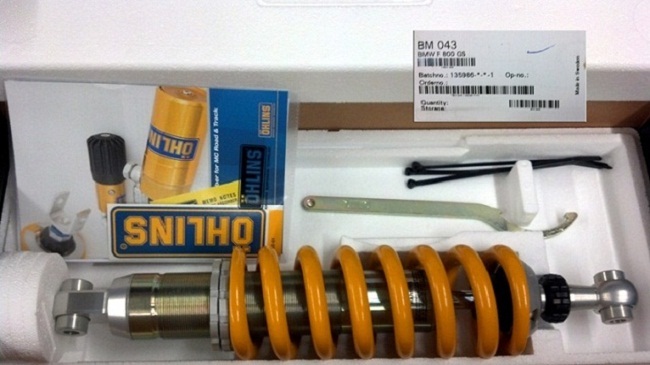 It also is the way the newer Bm305 Ohlins shock will have a version of the Integraded Preloader. Integrated preloader shown , must specify either LEFT or RIGHT , aka notice older BM 302 vs BM 305. 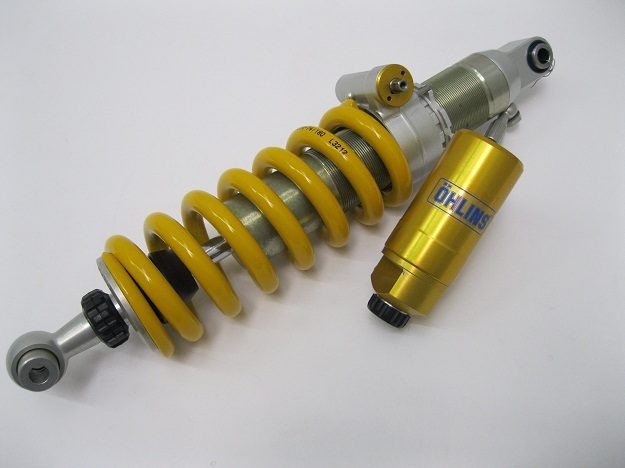 Ohlins Fork 30mm Super sized Cartridge Kits replaces non adjustable stamped steel 20mm standard outdated stuff. 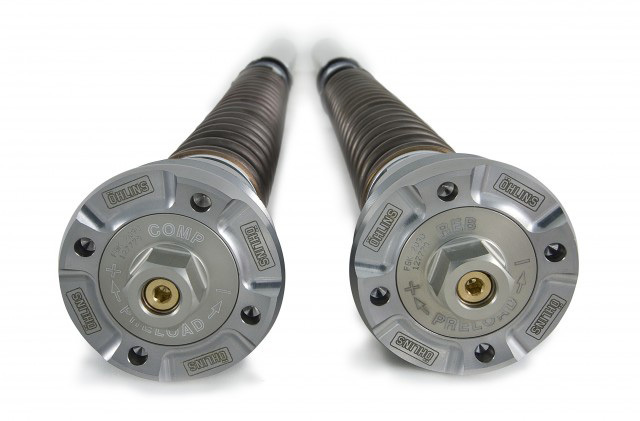 Adjustable external spring preload (18 Turn ) , compression (aprox. 24 Turn) and rebound (aprox. 24 Turn) optional spring rates available. Above (Red arrows) is stock stamped steel 20mm non-revalvable cartridge that is non adjustable in any way from the 1970’s. 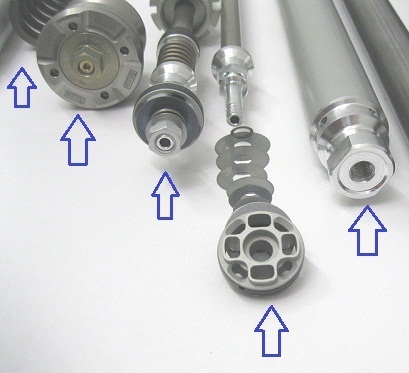 The (Blue arrows) Ohlins 30mm Cartridge shown on top, with a 55mm anti-bottoming cone, 30mm 4 prort pistons , and fully adjustable rebound, compression, spring preload all at the top caps. 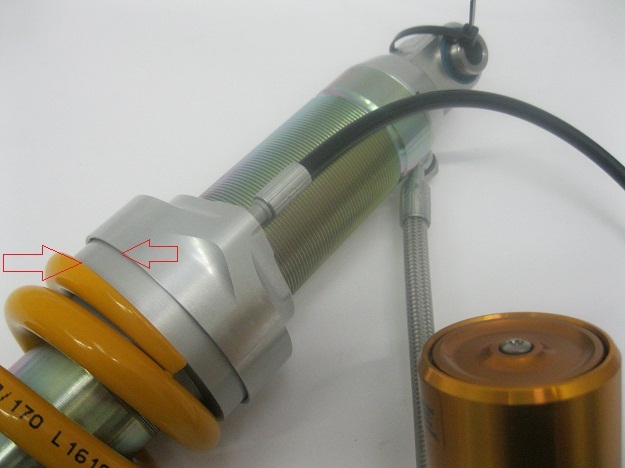 The Ohlins kit has fully adjustable rebound, compression, spring preload all at the top caps, the kit basically replaces everything inside the old fork shells from cap to bottom. 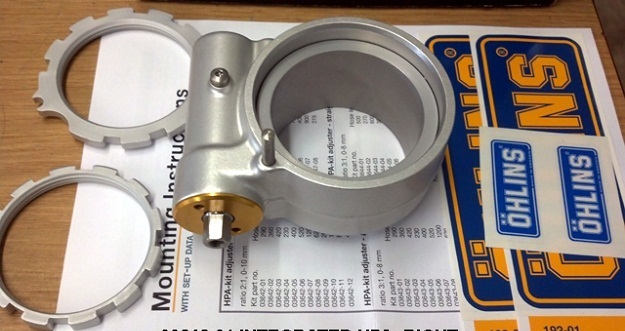 The Ohlins 30mm kit is 50% larger than the stamped steel stock with modern valving and 4 port piston design and many other well made features. Above center fully adjustable fork kit 30mm. 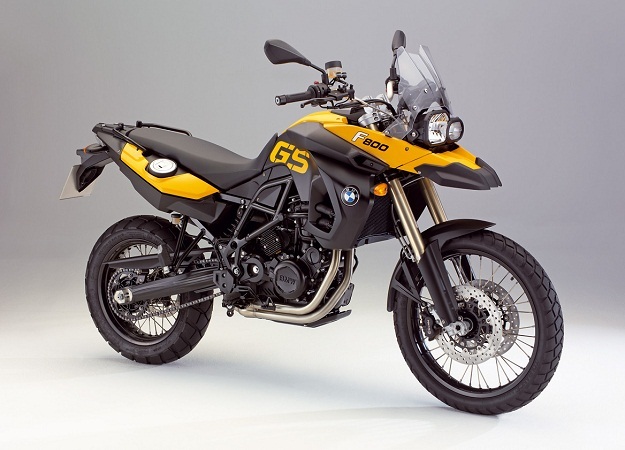 Touratech brand we can only sell as suggested List price (oooch!) 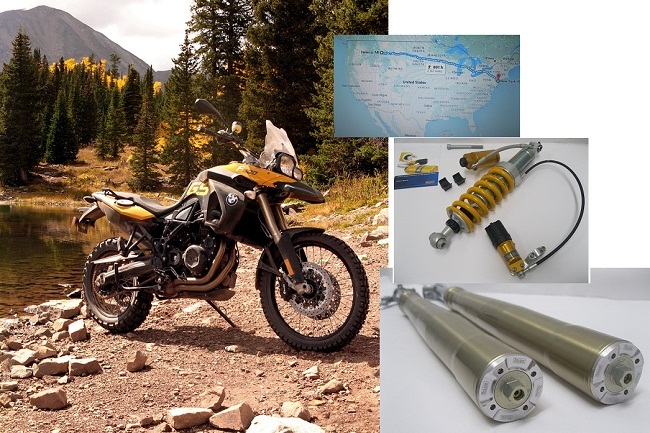 Shown Below $3290.00 LIST PRICE COMBO = the Touratech Shock (1495.00) plus Cartridge Kit (1795.00) But We can offer FREE UPS lower 48USA states shipping and No TAX o/s. 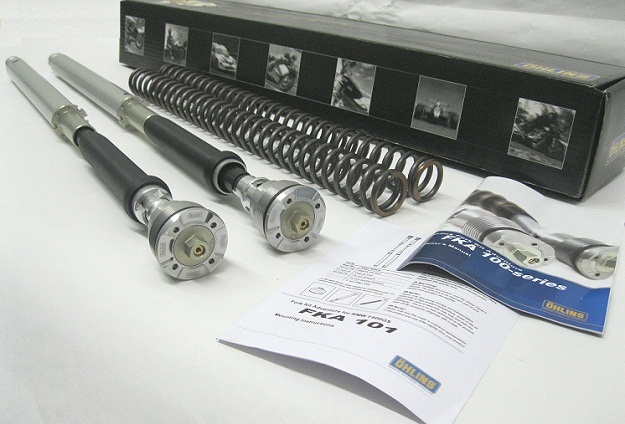 These are well built shocks that suit many needs especially if your more riding off road than mixed conditions. The Touratech’s claim to fame is the spring preloader that offers a 15mm range, all the Tourtech shocks come spec at 5mm in already used up so you really only have about 10mm more preloader range to add. 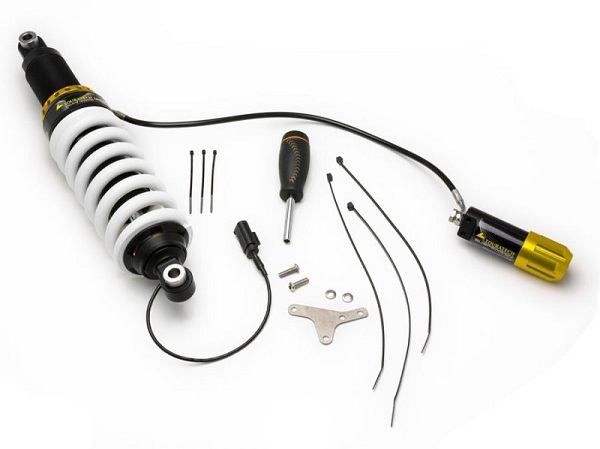 Reminder that most shocks max the spring preload close to 22-23 mm or then you need a different spring rate for best results. So how you set things to get there without exceeding the Max is up to your weight and needs etc. 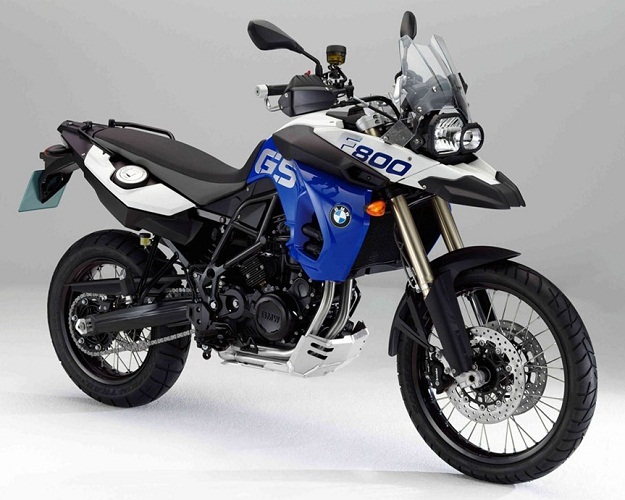 The ESA option for BMW’s 2013 and newer F800GS allows the rider to choose from three modes on the rear shock. 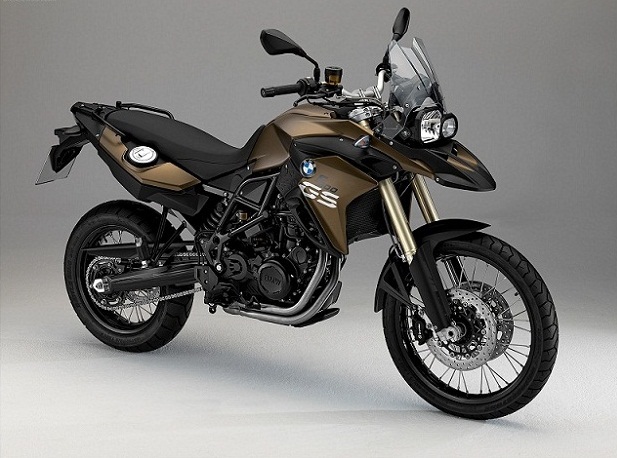 With the press of a button, the damping settings on the rear shock change between Comfort, Normal, and Sport. 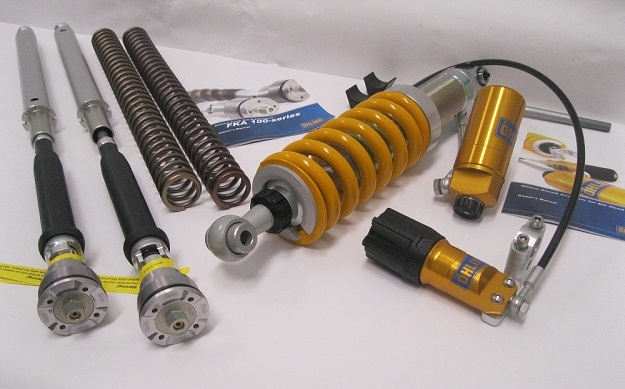 The shortcomings with the OEM shock are that the damping is set-up for a relatively lightweight rider who travels without luggage, and the unit is not serviceable. 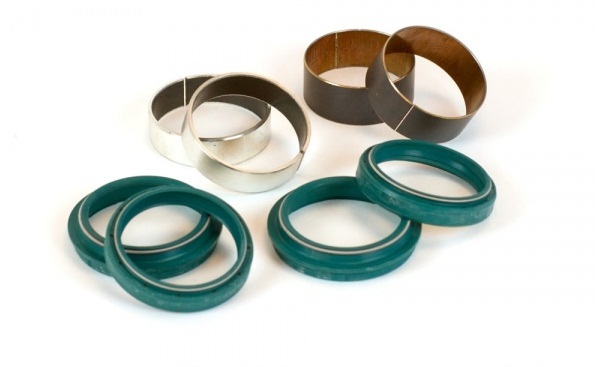 Material and design compromises made in order to hit a price point on the OEM unit result in a shock that will wear out or blow seals, long before the rest of the bike gets tired and it must be replaced. 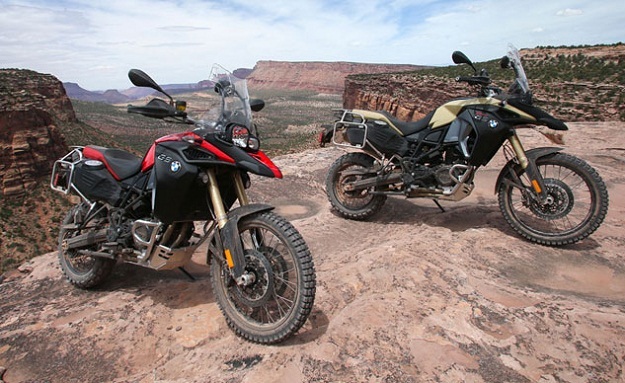 To solve these problems, Touratech Suspension has developed the Plug & Travel ESA Upgrade. 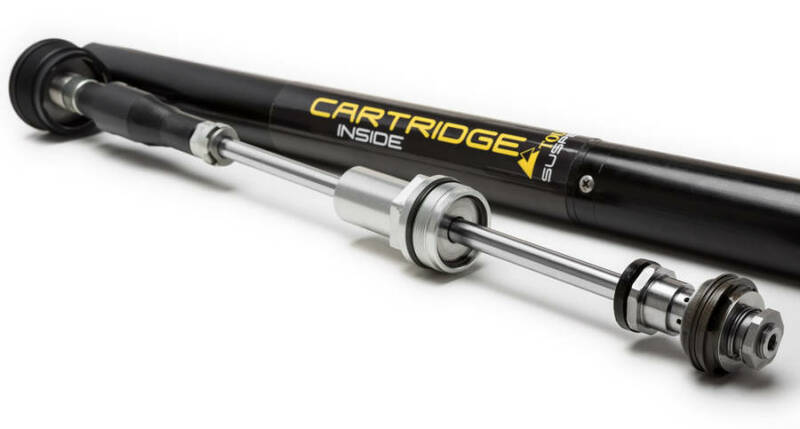 A high-performance replacement shock that offers world-class ride characteristics, is 100% serviceable, and is a bolt-on solution that plugs in to the BMW ESA system allowing the ride-mode buttons to function even better than stock.